Product prices and availability are accurate as of 2019-04-20 22:38:32 UTC and are subject to change. Any price and availability information displayed on http://www.amazon.com/ at the time of purchase will apply to the purchase of this product. This spiral bound format features maps that are 35% bigger than those found in Rand McNally's standard Midsize Atlas. 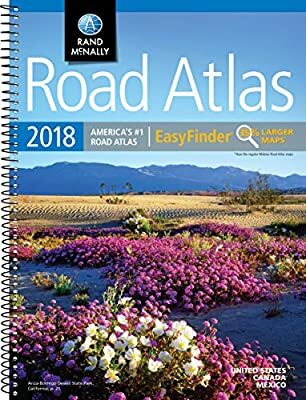 This updated North American atlas contains maps of every U.S. state and Canadian province, an overview map of Mexico, plus detailed maps of over 50 North American cities, all conveniently packaged for travel. Contains mileage chart showing distances between 77 cities and national parks with driving times map. Spiral binding allows the book to lay open easily. Best of the Road® - Our editor's favorite road trips from our Best of the Road® collection follows scenic routes along stretches of coastline, both east and west, to forests mountains, and prairies; and through small towns and big cities. For a weekend or a week there s something for everyone.